Let’s talk reality. The majority of Americans – including those who own small businesses – work for a living. They sell used cars, repair plumbing, work in home improvement. They are doctors, nurses, dentists, attorneys, and real estate agents. While professionals who own practices (doctors, dentists, attorneys, etc.) do earn more they also have much higher expenses so they often end up with even less disposable income than other small business owners. Those who can not tell that there is no recovery have no idea how the majority of Americans who claim to be middle class – but never really were – actually live. They do not know what they do with their money and time. because they definitely need a reality check. Note that in the next section these stats are for median household income. I point that out because in many cases more than one person’s income has been included. Most often in America today, it takes at least two incomes – and many of these people have many more than that – to earn these amounts. For all those who tuned out during their math classes, the median is the point where half fall above and half fall below. What that means is that half of all American families (not individuals – the entire family) earn less than $50,502 per year (as of 2011 and that is likely to have declined). That includes Americans who own small businesses. 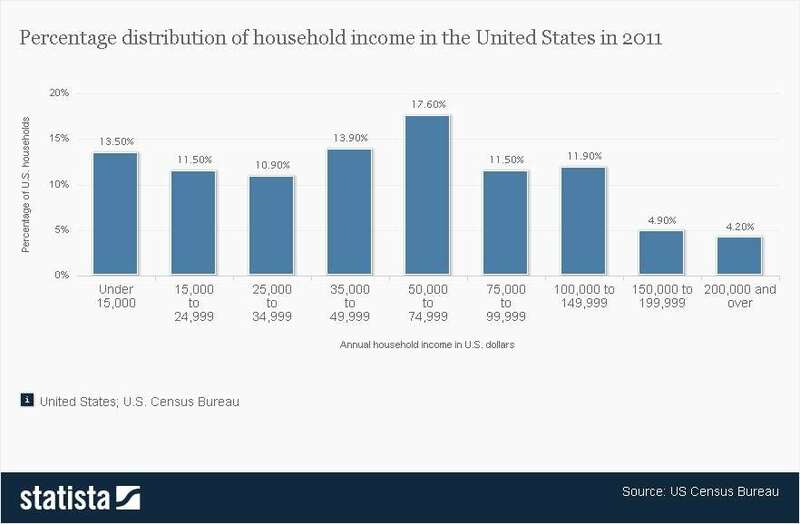 The statistic shows the percentage distribution of household income in the United States in 2011. 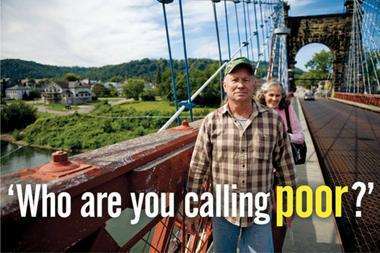 About 14 percent the U.S. private households had an annual income between 35,000 and 49,999 U.S. dollars. 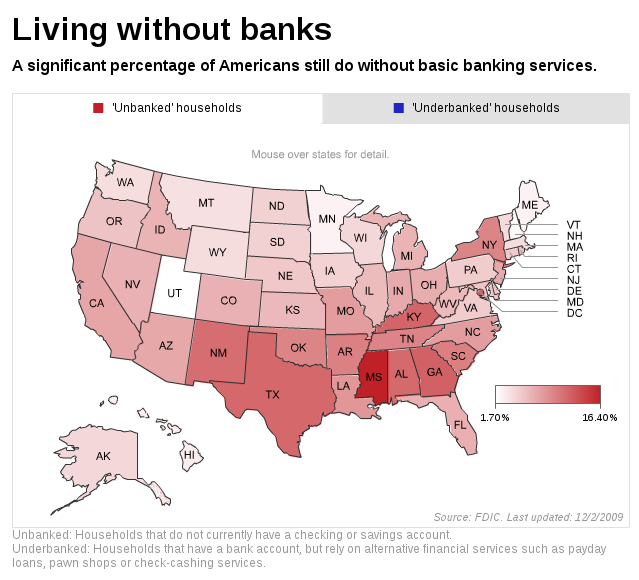 This map links to a live interactive version showing what percentage of Americans do not use banks. I hope those reading this will comment on what they found most surprising about the information in this post. I suspect many have no idea that almost 10% of people in New York and 11.7% in Texas do not use banks. Many more have some kind of account, but also use pawn shops, check cashing services, or cash checks they receive from employers or work completed at grocery and retail stores. Why did the 17 million figure get dropped to “nearly 10 million” when they claim the number has risen – not dropped? Even those who still have decent paying careers and believe they are middle class are in for a rude surprise: inflation is going to eat their lunches. Their buying power will continue to decline as I explained in WARNING to Small Businesses Targeting Affluent Markets. Median mortgage payment Chicago ? Median house payment Dallas ? Note the amounts in bold. Those are actual jobs paying those amounts that were listed on that site. Few realize there is no minimum wage in multiple U.S. states (Alabama, Louisiana, Mississippi, South Carolina, Tennessee) and is only $2 an hour in Oklahoma, and $4 in Montana. And many no longer get 40 hours as companies strive to eliminate full time employment and benefits by using contractors, consultants, or reducing employee hours below full time. Obamacare further incentivizes the elimination of full time jobs. There IS a solution: buying local and supporting small businesses. Corporations have moved manufacturing overseas, and even though insourcing is bringing some of it back, the pay will be lower and benefits non-existent because the union contracts have been removed. We need to understand that we can not maintain our “middle class” standard of living by going into debt and salaries have not kept up with inflation. The only way we will be able to survive is to change our lifestyles and return to slow growth without debt. There are many ways to earn money without having it reported. Some are online, some offline. Online services like Fiverr.com make payouts through PayPal. PayPal must report account activity to the feds if you both receive $20,000 in goods and services for the year and receive 200 payments. For other moneymaking venues like EasyShift, you’re sent a 1099-K if your earnings exceed $600. It seems obvious that one could cobble together a living wage from a variety of sources without having a bank account. Would it be enough to put you in the middle class? Probably not. But your tax burden would certainly be a lot less.